Michael Floyd Jr. (born November 27, 1989) is an American football wide receiver for the Arizona Cardinals of the National Football League (NFL). He was drafted by the Cardinals in the first round of the 2012 NFL Draft. He played college football at Notre Dame. Floyd attended Cretin-Derham Hall High School in Saint Paul, Minnesota, where he was a three-sport star in football, basketball and track. He played for the Halloween Raiders football team as a wide receiver. As a senior, he recorded 59 receptions for 1,247 yards (21.1 avg.) and 17 touchdowns, and added 497 rushing yards on 43 carries (11.6 avg.). He also returned 16 punts for 373 yards (23.3 avg.) and four touchdowns, helping to lead his high school team to a 13-1 record and appearance in the state championship game. In order to afford the school, Floyd worked off a scholarship by helping the custodial staff clean the school before the day started. Floyd was named Minnesota Player of the Year twice by the Associated Press and Gatorade (2007, 2008). He was a USA Today High School All-American in 2007, and was picked to play in the U.S. Army All-American Bowl in San Antonio, Texas. In addition to football, Floyd also participated in basketball and track while at Cretin. In basketball, he averaged 23.5 points per game as a senior for the Raiders, scoring at least 30 points in six games. He totaled 1,380 points in his basketball career, finishing just 86 points short of the school record for most career points. In track & field, he competed as a sprinter and long jumper during his senior year. He recorded personal-bests of 22.9 seconds in the 200-meter dash and 6.40 meters (20 ft, 6 in) in the long jump. Considered a five-star recruit by Rivals.com, Floyd was listed as the No. 3 wide receiver in the nation. He chose Notre Dame over offers from Michigan, Iowa, Florida, Ohio State, and Miami (Fl.). As a true freshman at Notre Dame, Floyd played in 11 of Notre Dame's 13 games on the year, only missing the final two games of the regular season (Syracuse and USC) due to an injury sustained early against Navy. He recorded seven touchdown receptions on the year, breaking the record for an Irish freshman (previously held by teammate Duval Kamara's four TDs in 2007), while catching 48 balls to break another Notre Dame freshman record in receptions (Kamara had 32 in 2007). His 719 receiving yards set the mark for Notre Dame first-year players (Tony Hunter had 690 in 1979). Floyd began his sophomore season with 3 touchdowns and 189 yards receiving on 4 receptions. Later in the season, Floyd suffered a fractured clavicle, which prevented him from playing in 5 of Notre Dame's 12 games. He returned from that injury and finished the season with 9 receiving touchdowns and almost 800 receiving yards in 7 games of action. In 2010, Floyd started every game leading the Irish to an 8–5 record. He ended the season with 79 receptions for 1,025 yards and 12 touchdowns. The 79 catches ranked second in Notre Dame single-season history, while his 12 touchdowns tied for fourth most in a season and his 1,025 receiving yards ranked seventh. Floyd was named MVP for Notre Dame and the Sun Bowl. After being suspended from team activities for several months, Floyd was reinstated in August just as fall practice began. In 2011, he started every game leading the Irish to once again, an 8–5 record. He finished the season with 100 receptions for 1,147 yards and 9 touchdowns, including one rushing touchdown. His 100 catches marked a new career best, and also set a new school record, surpassing former teammate Golden Tate's 93 receptions in 2009. He also set school records for career receptions (271), career 100-yd games (16), receiving yards (3,689), and receiving touchdowns (37). Floyd was officially picked as the 13th pick of the 2012 NFL Draft joining the Arizona Cardinals to play alongside Larry Fitzgerald, another Minnesota native. This gives the Cardinals a formidable 1-2 punch at receiver. “ "I love this marriage. I'll tell you something right now, there is not a better role model for him in the NFL at the wide receiver position than Larry Fitzgerald. He will mentor this kid and get the most out of him." Floyd began the 2012 NFL season as a backup wide receiver. He did not record any stats in the team's first two games against Seattle and New England. Floyd's first career reception was a juggling 8-yard touchdown off a deflected pass in a 27-6 win against Philadelphia. As the season progressed, Floyd began to receive increased targets and playing time. He caught 5 passes for 80 yards in a loss at Green Bay, both of which were career highs at the time. He had the best statistical game of his career in the Cardinals' season finale against the 49ers, where he had 8 receptions (on 14 targets) for 166 yards and a touchdown. Arizona did not make the playoffs, so Floyd ended his first career NFL season with 45 receptions for 562 yards and 4 touchdowns. ↑ Lourie, Steven. "Arizona Cardinals 2012 Draft Grades". Retrieved May 1, 2012. ↑ "Michael Floyd suspended for DUI charge". ESPN. 21 March 2011. Retrieved 22 March 2011. ↑ "NFL Combine Results - Michael Floyd". NFL.com. NFL.com. Retrieved 2014-12-12. 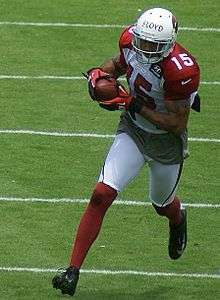 Wikimedia Commons has media related to Michael Floyd.